Finding out that your loved one has dementia or Alzheimer’s disease can feel daunting. But staying educated – along with keeping the right attitude – can help. November is National Alzheimer’s Disease Awareness Month. An estimated 5.7 million Americans are living with Alzheimer’s or dementia. Over time, your loved one may need more support. Your relationship with them will change. They may need to adopt a new routine to make their day as easy as possible. This could include scheduling tasks such as doctor’s appointments earlier in the day when they are more alert. It also may mean allowing your loved one more time to complete tasks and taking frequent breaks throughout the day. Try to stay flexible and relax your expectations. Part of the change includes making adjustments to your loved one’s home to prevent the risk of injury. That’s because Alzheimer’s Disease can impair judgment. Check the water temperature before your loved one takes a bath. You can also turn down the heat on the hot water heater to avoid burns. In addition, you should install safety mats and bars in the bathtub, or a shower chair. You may also want to install locks on cabinets containing dangerous chemicals, medicines or tools, and keep matches and lighters out of reach. 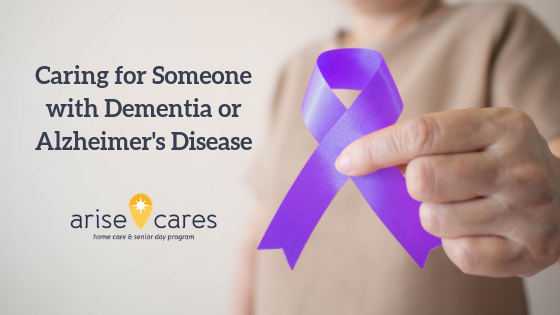 Because every person with Alzheimer’s or dementia is different, every person may require a different amount of care. Sometimes, this may mean more care than you can accommodate all on your own. Arise offers a senior day program to give your loved ones the attention they need– and you the time you need for vital errands. It’s staffed by compassionate, trained professionals and conveniently located in St. Cloud at 2907 Clearwater Road. Arise also offers home care and long-term care. You can have peace of mind knowing your loved one’s needs are met. Visit our website for more information.